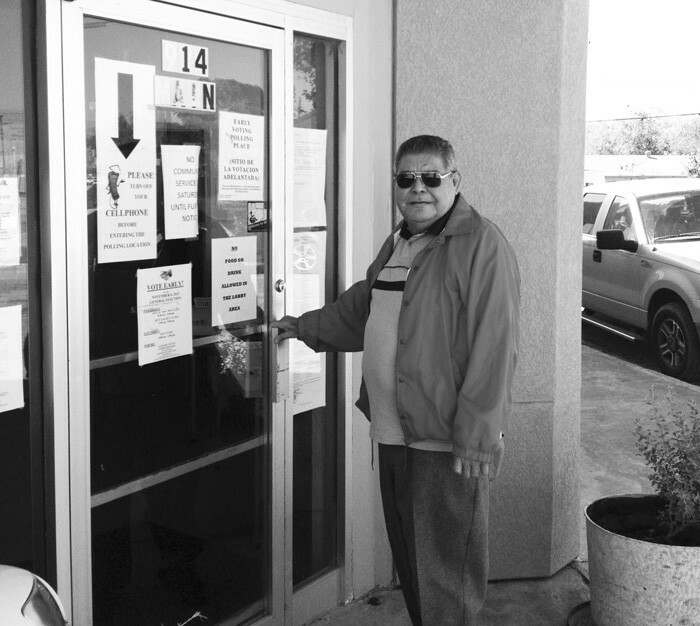 Arnie Garces prepares to vote early for the November General Election. Early voting continues through Friday, 8 a.m. until 5 p.m. Polls will open at 7 a.m. on Tuesday, November 6 and close at 7 p.m. Early voting is still underway through November 2 and voters have made their way to the Atascosa County Election Administrators office at the Annex building in Jourdanton. Voters can still cast their vote now through Friday, 8 a.m.-5 p.m. The sample ballots can be found online at www.pleasantonexpress.com. Election Day is next Tueday, November 6. The polls will be open from 7 a.m. until 7 p.m. Please see the polling locations on page 14. 7. A copy of a current utility bill, bank statement, government check, paycheck, or other government document that shows your name and address. While the Presidential Election is on everyone’s minds, here in Atascosa County, local races should also get voters to the polls. Loretta Holley and Precinct 3 Commissioner, Freddie Ogden; Constable Precinct 3 Rick Luna; and Constable Precinct 4 William “Bill” Meadows . The City of Christine is the only municipal election that will be held. While Mayor Odell Vasquez drew no opponent, at-large alderman incumbents Vicente Valero and Christi Castellano have one opponent, Olga Esquivel. Somerset ISD will have two polling places in Atascosa County for their election. District 4 seat incumbent Robert Sanchez will face Sean Patrick William. Jourdanton will not hold elections for city nor ISD this year. Charlotte ISD and the City of Charlotte drew no opposing candidates and will not have elections as well. For more information, contact the Atascosa County Elections Administrator Janice Ruple, 914 N. Main, Jourdanton, TX 78026 or call 830-769-1472.